With all the complex regulation that surrounds the background screening industry, employers need a solid foundation – an easy way to reference common terms used in background checks. 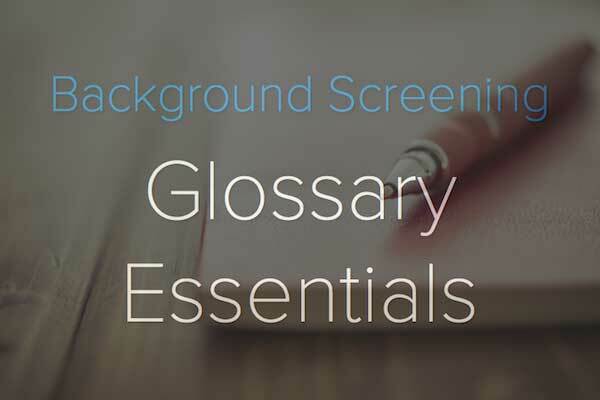 That’s why we wrote the Background Screening Glossary Essentials Series. In this series, we’ve categorized the terms in our full (and free) Glossary. Think of it like a study guide! Every few weeks, we’ll post another list of Essentials to so your team can hone in on what’s most important to make informed hiring decisions, mitigate risk, and maintain compliance. Let’s kick it off with the most important terms you need to know for general background screening. Address History – A list of addresses associated with an individual used to drive a variety of background screening services, such as selecting jurisdictions for a criminal record search. Adverse Action – A decision that adversely impacts the subject of a background report based all or in part on the results of the report. Background Report, Background Check, Background Screen – The collection of information about a consumer assembled by a CRA used to make an employment or tenancy decision. Consent Form – A clear and conspicuous, stand alone document that must be provided to a consumer before a background report is initiated according to the FCRA and several state/local laws. The Consent Form discloses that a background report is being run and seeks authorization from the subject of the report (consumer, applicant, employee, tenant, etc.) in order to proceed. Consumer – The subject of a background report, such as an employee, applicant or tenant. Consumer Report – As summarized per the FCRA: communication of information by a CRA to serve the purpose of establishing the consumer’s eligibility for credit or insurance, employment or other authorized purposes. This can be a credit report as a stand alone document as well as a background report that does or does not include credit. Consumer Reporting Agency (CRA) – A company that collects and/or assembles consumer information for the purpose of furnishing a consumer report. Credit Bureau – An organization that collects and maintains credit records and credit scores on a consumer. The three main credit bureaus are: Experian, TransUnion and Equifax. Credit Report – Collection of a consumer’s credit history, most often sourced from a major credit bureau. Only in specific scenarios may an employer use a credit report and/or credit score to make an employment decision. Disparate Impact – Employment policy or practice that results in discrimination rather than a consequence of the intent behind it. Dispute Process – The process by which incorrect information is identified on a background report and brought to the attention of the CRA for the purpose of correcting the report. A dispute does not always result in amending the original report. End User – The recipient of a background report procured by a CRA such as an employer or landlord. Estimate Time of Arrival (ETA) – The approximate date a service or report is expected to be completed assuming no unforeseen delay. Investigative Consumer Report – A background report that acquires information on a consumer’s character, general reputation, personal characteristics, or mode of living and is obtained through personal interviews with neighbors, friends, associates or acquaintances. Permissible Purpose – Reasons under which a background report may be lawfully requested, obtained and/or procured. Additional standards may apply for credit reports when used for employment or tenant purposes. Social Security Number (SSN) – 9-digit code assigned to a US Citizen, permanent resident or temporary resident. SSN Randomization – A change implemented on June 25, 2011, affecting the way SSNs are issued in order to extend the longevity of the nine-digit SSN and protect the integrity of the numbers, including elimination of the geographical signification, or the area number. Summary of Rights – A summary of the consumer’s rights as it applies to background screening. Consumers must receive a copy of the FCRA Summary of Rights. Additional state and local summaries may be required. Turnaround Time (TAT) – The duration between placing an order and receiving the final results of a background report. Wet Signature – Hand-written signature (pen and paper). Know these definitions and you’ll be well on your way to getting more out of every background report. Subscribe to our blog and follow us on social media to receive this and other great articles right in your inbox. Just CLICK HERE to get connected!